I meant to write this post last week but time has been very wily the last few weeks and it seems to be hard to corral. I have been reading Brene Brown's book The Gifts of Imperfection the last few days. There is a lot of great stuff in her book...simple thoughts to remind me what is important in my life. Like, taking time to just be, hang out with my family, read a book, make some art, take a friend to tea for her birthday. At the end of the day, I tend to focus on what I didn't get done rather than what I did do...which results in a feeling of inadequacy that is always present. You know...the 'if I was better organized I would have gotten it all done' or 'Sheeesh...why can't you manage to keep just one counter clean'. I am my own worse nag and it makes me feel terrible. Why do I beat myself up so much about things that really just aren't important. So, from here on out my plan is to reflect at the end of each day on the things I did accomplish rather than my failures. With that in mind I will not nag myself for being an imperfect blogger but will tell you about my great field trip 9 days ago...when the weather was warm! I have a couple of great textile and mixed media groups that meet in Monument and Colorado Springs. One of these groups, Discovery, decided to go on a field trip to Pueblo (about an hour south) to see a quilt exhibit at the Sangre de Cristo art center. We were treated to two great shows both connected by the topic of 'children's books and art'. The first exhibit, Winter Lights: A Season in Poems and Quilts by Anna Hines was a delightful pairing of children's winter poems and quilts that illustrated them. The quilts were traditional in construction and design but most had a contemporary feel. The construction was simply amazing...meticulous paper piecing of tiny spiraling log cabins...often executed all in black. Incredible workmanship to celebrate winter. The second exhibit was my favorite. Stephen Johnson has taken the art of letters and numbers to a new level. I had not seen his books previously as I am a bit out of the children's art book temporarilyas my kids are too old and my grands too young but I think these might find a spot on my shelf. Stephen Johnson's art shows a wide range of styles which made me feel a bit better about my own eclectic mix of work. There were works from Alphabet City, City by Numbers and my favorite, A is for Art which features abstract art and the descriptions of the art works were alliterative poetry themselves. The abstract pieces included fake french fries, lime ladders and red rubber bands in a big pile. They were fun and not quite so serious. Stephen Johnson's work in Alphabet City and City by Numbers is totally different, watercolor, pencil and pastels worked in a photo-realistic style. It was so much fun looking to find the letters or numbers in the paintings, some were obvious, some were in the negative space and some you had to really look for. Unfortunately, both these shows are done but you can get the books! After the shows we grabbed a quick lunch at the little cafe on the premises, Francos...what a treat that was. Francos' had a great selection of gluten free offerings that were really tasty! Cross contamination is a big concern for me when eating out but the chef assured me that he completely understood because his daughter was very sensitive as well. YAY! I had a great messy sandwich...what a treat. Those not eating gf were all delighted in their meals so if you go to Pueblo check it out! We tacked on a little side trip that was the polar opposite of the art center experience. The junk yard! Oh my gosh we must have looked so funny...two cars pull up and 8 ladies get out exclaiming with delight over the piles of rusty junk. I am sure the owners are still shaking their heads. We had a great time looking for tool boxes to repurpose for art supplies and intriguing rusty shapes to use for rusting fabrics. I also found a great non-rusty aluminum 'thing' for soy wax batik. This place had everything from rusty screws and things that were too disintegrated to fathom their original purpose to street signs and doctor's forceps. Don't think I would use the old forceps for doctoring but they would be great for assemblage work and other arty things. I was positively drooling over this antique cash register! It wasn't for sale but I must say I got a great pile of rusty stuff for $20. unfortunately this 'found' rusty fabic was too fragile to use but isn't it beautiful? We made one last stop at the quilt shop in Pueblo and headed home...Oh, almost forgot...it was about 64degrees in Pueblo that day! We soaked up the sun and that helped get us through this last especially frigid week! I am so happy that I made time for this field trip with friends. We all agreed that we 'need' to put more of this into our lives. Stay tuned for an announcement of two free on-line book studies!! I know a few of you have been waiting patiently for us to....ummmm...get organized! Ruth Chandler and I plan to start Fabric Embellishing on Feb 21st and I will begin Threads the week after that. Details very soon! Thanks for waiting while we get our ducks in a row. Who says you're an artist? I had a great weekend…started with my Visual Journaling class on Sat morning where I had them take a baby step toward drawing and they were brave! Then I took my students on a field trip to Denver…well technically, one of my students drove so I guess she took us. We went to hear a talk given by Laurie M Hawley of Aha Life Designs. Laurie’s topic was the Road to Authenticity – Embracing Imperfection and Feeling Worthy. The talk was inspired by Brene Brown’s book The Gifts of Imperfection: Let Go of Who You Think You’re Supposed to Be and Embrace Who You Are.I am a big fan of Brene Brown. She has a couple of talks available on TED that are really great. Laurie shared her experiences on her journey to discovering joy in her life as well as facing the painful parts of embracing imperfection. A lot of what Laurie talked about really resonated with me…my own journey...especially being a perfectionist as it is something that I have and still do struggle with. Perfectionists continually seek external validation. Laurie talked about her creativity and life coaching business and how she strives to be the best coach she can be and to that end is continually participating in further training. Which is great for her clients but when is enough, enough? When do ‘they’ see fit declare that you an expert…or in my case, an artist? I wanted to be an interior designer when I was young but that wasn’t ‘practical’ so I got my degree in business management. Years later when I decided that I really wanted to be an artist my first roadblock was how to go to art school? I didn’t have the time or money to go to art school and everybody said you really had to have an MFA to be an artist. I longingly perused the UK’s City and Guild’s program…even on-line it was still too expensive. How would I get the certificate that declared, YES, I was an artist?? I decided that formal education would just have to wait until the kids were launched even though that meant I wouldn’t get that validation until I was at least 56 and maybe even 60. In the mean time I took whatever workshops I could, read every book I could get my hand on, joined art groups and I took baby steps. I changed the name of my sewing room to ‘studio’. That was incredibly difficult! It took me at least 3 years to feel comfortable calling it a ‘studio’. I mean really…how pretentious!! I certainly couldn’t bring myself to utter the words ‘I am an artist’. When friends called me an artist I rolled my eyes and dismissed their comments…after all, I hadn’t earned that degree yet! A funny thing happened while I was busy raising my family, homeschooling, taking creative technique classes, and making stuff. I became an artist. I still didn’t have the diploma that officially declared it but the more confident I became in my skills and the more I talked to ‘real artists’ it slowly dawned on me that being an artist isn’t like being a lawyer. There isn’t a test to pass, a degree required or any hoops to jump through. Being an artist is a state of mind. The only person, entity or even country that can truly declare someone an artist is one’s self. Go ahead…declare yourself an artist! Hey, want to make today Declare Yourself an Artist Day? We could start a movement! The photos in this post are from my very first soy wax batik experiments done last Thursday at my Discovery group. This group explores art techniques...not always related to cloth. If you are in the Colorado Springs area let me know and I will send you the meeting details. We always have fun and I am now in love with soy! 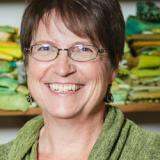 Last week I had the pleasure of give two thread lectures at High Prairie Quilts in Parker CO. I love talking about thread and sewing so giving these talks is always a lot of fun. One topic that always comes up at these lectures is linty thread. When exactly did lint in the bobbin case become a terrible plague on stitching humanity? Have we made a mountain out of a molehill? In the last 5 or so years there have been quite a few thread manufacturers telling us their brand of thread is the best we can buy because it is lint free or as close to lint free as possible. We ooohh and aaahh over this marvelous product and believe that lint free is the way to be. I admit to buying into the lint is bad story myself. But, if you stop a moment to really think about lint and its origins you just might have to accept an alternate reality. We tend to forget one little detail…the fabric we are stitching on supplies our machines with its own bit of lint. If we are stitching on homespun or loose weave fabrics we are rewarded with copious amounts of the evil lint. I will let you in on a secret…if you take all the lint off of a thread you will cause un-spooling problems because the thread is so slick it just falls off of the spool. The little hairs you see on thread are actually beneficial. Yes, I admit that excess lint in the bobbin case might cause all sorts of problems from skipped stitches to the dreaded bobbin rats nest of tangled thread but how much can we blame the thread and how much our sewing machine hygiene regimen? It may seem unlikely that my thread lectures include a firm admonishment about appropriate sewing machine hygiene but it is actually one of the more important parts of my lecture. Every time I ask how many attendees clean their machine regularly I am met with embarrassed and yes, even shame filled faces! We are so quick to blame poor defenseless lint for our stitching woes when the hard reality is that we have simply neglected the task of cleaning and oiling our precious machines. How often should we clean and oil? That depends on how much you sew, the type of machine you have and even the environment you live in. Always refer to your machine’s instruction manual to learn how to clean and oil your particular machine. When I am sewing for most of the day I will clean and oil my machine before I stop for the night. It seriously only takes about 2 minutes. A good guideline is to clean and oil after every 8 hours of sewing. I live in a dry and dusty environment so I try to clean my machine more often. Remember that cleaning out the lint is only one goal. Oiling your machine properly will add years to its life and your machine will thank you. The bottom line is that there are very few threads on the market today that cause so much lint that it can be problematic. Clean your machine (often), don’t take everything a manufacturer tells us as gospel and let’s let lint dissolve back into the molehill that it really is. I kept asking myself if I had completely lost my mind...planning a vacation just a little over 2 weeks before International Quilt Market and Festival. For those who don't know, IQM and IQF are the biggest events of the year for anyone in the quilt industry. But sometimes you just have to go...so go we did. Middle son, Scott had to work so it was just hubby and youngest son Mike. Good thing too since the cottage we rented was just barely larger than my kitchen...and I don't have a big kitchen! We listened to Jules Verne's Journey to the Center of the Earth on the drive up. Chosen by chance but certainly appropriate subject matter. October is a dicey time of year to visit Yellowstone...they close most stuff down by Oct 11 for good reason. However, the weather was on our side and even the one morning of rain was not enough to keep us inside. Of course being wet was preferable to being in the tiny cottage but it was only a light rain alternating with mist so we hiked through it. Our weather risk taking was rewarded with few other visitors and plenty of wildlife to see. The most amazing animal we saw was a wolf. We have read a lot about wolves in our homeschooling adventures so we knew that a wolf sighting would be pretty rare. But, a couple of wolves had been hunting an old or sick bison for a couple of days and had her cornered not that far off the road. We stopped at the viewing area just after a single wolf had finally killed the bison. It wasn't a bloody battlefield thank goodness. We spent about an hour watching the wolf. We were too far away to get a good photo but I was able to get this one through a spotting scope one of the rangers had. I was also amazed at the incredible array of cameras everyone was toting. We were definitely outclassed! Evidently the serious wildlife photographers go to Yellowstone in Oct.
We saw plenty of elk and bison, fox and coyote, mountain goats, deer, 4 grizzly bears, one black bear and 3 otters. The word for the week was weird!. I really didn't know what to expect in the topography of Yellowstone. It is...well...weird. Weird to know you are walking on top of a volcano...one that is still active no less. Weird to watch geysers spouting water hundreds of feet into the air. Weird to see boiling water bubbling in a pool. Weird to see steam rising up all over the landscape. Weird mud pots where the acidic water is dissolving the rock and creating hot bubbling mud pools in a multitude of colors. Weird rock formations everywhere and stands of dead burnt trees rising above new forest growth. Yellowstone is incredibly inspiring as well. I took dozen's of photos of interesting textures and color combinations. The waterfalls in the canyon are amazing. Have I used the word amazing too much? If you haven't been it is definitely a destination to put on your travel list. To be told of its wonders and look at photos just isn't the same. It is a wild, weird and wonderful place! Go there...you will be glad you did. I am headed back to the studio to get packing for IQF but here are some more photos of our trip for you. the roots of this tree look like an eagle! Threads: The Basics and Beyond! Woo Hoo!!! Threads has arrived! I am just a little bit excited...OK so I am bouncing off the wall kind of excited!! I am so incredibly delighted with the entire design and layout of this book. It is hard bound with a SPIRAL binding so it lays flat! The design is clean and contemporary with hundreds of awesome step by step photos and clear directions...176 incredible pages! Threads is the complete visual guide to thread techniques and creativity and if you do any sewing with thread you are going to treasure this go-to guide. Gotta have a give-away of course!! Leave a comment below between now and midnight on Sunday Sept 12, 2010 and I will pick one lucky winner. Oh, heck, I am so excited I am going to throw in a great tote bag that didn't make it into the final book because we ran out of room. I had a blast making this tote bag but I am just not a pink kind of girl so one lucky winner will get this bag and a copy of Threads: The Basics and Beyond! What, you want thread too??? Well of course I will throw in some of my favorite threads for you to play with! I can't think of a better way to spend a summer evening than my adventure last night. I attended Regina Benson's opening reception at the Denver Botanical Gardens with some friends! Regina's show is wonderful...you have until Oct. 3rd to see it. The show is in the Gates Garden Court Gallery. The walls of this gallery are cement and Regina’s work shows beautifully against them…a study in contrast and unity. For you local folks, Regina is giving a gallery talk on Sept 9th and a workshop on Sept 18th. Check the DBG website for details. Her workshop will be about her fascinating technique for embossing fabric with natural materials. August 25th is the next free day at the DBG. After seeing the show we spent a lovely evening strolling in the gardens. There is also an exhibit of Henry Moore’s sculptures on display. They are immense works of art and often best viewed at a distance. I have to say I enjoyed his figurative work more than the abstract pieces which is a reverse viewpoint for me. I was delighted to see some great improvements at the Botanic Gardens. I haven’t been to the there in a few years…once the pocket gophers set up their stronghold I lost heart in the battle for rule over the garden. I am a bit heartened this year since we have a red tail hawk that likes to hunt in our neighborhood and the rain has kept the ground moist so they tend to stick to their field rather than my garden. The photos I took at the garden are so inspiring that I am tempted to put on my battle gear, gather my scythe and hack my way through the weeds to wrest control from the little buggers…or maybe I will get a tall glass of ice tea and read a gardening book on the deck. Who knew watermelon vine was so beautiful? I am not much of a dyer. I don’t measure or take notes, nothing I dye is ever reproducible. I do follow all safety rules but that is where order stops and chaos begins. I do have a lot of fun and try to remember my color mixing theory so I don’t end up with mud…but even when I forget I end up with some nice surprises. Sunday was a perfect day for dyeing. No afternoon rain or much wind so I set my production table up outside in the shade and started flinging dye. I started using a brush to apply the dye but ended up mostly just pouring the dye on the fabrics…couldn’t find any basters. I only had a few pieces of wool, silk yarn, white silk organza and white silk chiffon so I raided my studio for anything silk. I found a bunch of silk dupioni remnants that a friend had given me and two silk blouses that were perfect for experimenting with. I have to say I didn’t even prewash the silk dupioni and since it was drapery fabric I didn’t think it would take the dye well but I threw it in the mix as any true dye renegade would and I am just delighted with the results! The two shirts dyed up fabulously also...love free material! One was a sage green sueded silk and the other was a peach shirt. Don’t you love the pockets! The chiffon turned out fabulous! Unfortunately, it is really hard to photograph well…the patterning is subtle on some and not so subtle on others. I love silk organza. I pressed most of this but left a little chunk un-pressed to remind me how cool it is all crinkled up. I used some un-pressed organza in one of the silk rod samples in Fabric Embellishing: the Basics and Beyond. It has such great texture and color play. These also didn’t photograph well but you can believe me they are awesome and actually just what I was aiming for color wise. The wool took a lot of dye because it was already felted but it was the last thing I did so I just poured it on heavy. I ended up with an incredible batch of clean-up paper towels too! I’ll show you what I did with some of those tomorrow as well as the silk yarn which has taken longer to dry. Art~Craft, Studio~Sewing room~Craft room, Artist~Crafter~Dabbler…what do you call yourself? What we name ourselves and our spaces is important...it is one of the ways we tell the world what is important to us. When I decided that I wanted to become more serious about my passion for stitching and art I thought I should change the name of my sewing room to studio. Easy right? NOT! I felt so pretentious calling my messy thread covered room a studio. It actually took me 2 years to make that change. I couldn’t bring myself to accept the title of ‘artist’ for another 2 years. What is the big deal about the title artist? Why have we elevated the title ‘artist’ to an award we bestow upon a small percentage of our population? Who gets to decide who is eligible to be an ‘artist’? Back in the middle ages many things we consider art today were thought of as craft…painting was no different an occupation than a cobbler. During the Renaissance painters and sculptors got a boost up the ladder to join poets and musicians as ‘artists’. The art academies later elevated these media to the status of ‘fine art’. More recent movements in the art world are bringing art back into the hands of the masses and changing the way we look at and define art. Has the pendulum traced its longest period? I hope so! Everything in nature seeks balance and I think we will see more acceptance in the art world as we as individuals balance art and technology…even combining our art and technology. The art~craft debate will slowly die off as we allow the creator to define which of their creations are art and which are craft. When I think about the future of art in all the different media and forms I get so excited. One day, we will look back and laugh that we even had such silly arguments over art and craft…sort of the way we laugh at the clothes we wore in high school. Art is nourishment for the human spirit. We are all born to create stuff and we are all better humans when we do just that. Go make the world a better place…go make some art in your studio! When I was in Estes Park for my guild lecture 10 days ago I had a lovely dinner with some of the guild board members. Talk meandered around quilting and art of course. One of the board members is involved in creating an arts program for a school in Oklahoma. We had a great discussion about the lack of art in many of our schools, what that means for future generations and what this particular school is doing to make things better for their students and community. It has been my experience that one of the key lessons of making art is learning how to get through the ugly stage. Most art has an ugly stage…that point where you can’t stand it and think it is hopeless and maybe you should simply give up and become an accountant! But, no matter how ugly you think it is if you keep working at it the art develops and becomes a thing of beauty. It is magical when it comes together! So many things in our lives have an ugly stage that just needs to be gotten through; kids, home remodels, marriages and gardens to name just a few. My garden has had an extended ugly stage thanks to a plethora of pocket gophers who think my yard is a 5 star gopher resort! But I do have some stalwart bloomers who won’t give up and bloom despite the gophers. Today let’s celebrate perseverance in art, gardens and life. Cheers for the Ugly Stage! I just received my copy of the Quilting Arts TV Series 600 and am happy to say that I don't sound like an idiot! I still can't get used to my face with make-up and my nails without paint and ink stains but I think my episode (604) turned out great. Pokey Bolton is an amazing host and so talented too. Being on Quilting Arts with her was such a great experience. She made it so easy to ignore the cameras and just explain the technique I was demonstrating (Free Form Embroidery). I have only had time to watch a couple of the other episodes but I can tell you that this is a great series! I share the series with Jane Dunnewold, Mary Hetmansperger, Susie Monday, Terry Grant, Kathy Mack, Luana Rubin, Lindsay Mason, Andrea Bishop, Karen Fricke and more talented artists! You can order the entire series on DVD from Quilting Arts. It seems we were about 15 minutes too late to see the bear. Not that I am complaining but it would have been fun to share a photo of a bear with you all! A couple of times a year I take my camera along on my walk and take photos of whatever catches my fancy. These photos become inspiration for art either as images, texture or line. I thought I would share my walk with you so you can see what inspires me and get a feeling for the area I am lucky to live in. Coloradois incredibly beautiful although sometimes you have to look a little more closely to see the beauty…we are a high plains desert after all. Generally our wildflowers are not showy. If you look carefully at the photo above you can see a tiny bit of red wildflower peeking around the penstemon. I thought this was a cheerful July 4th arrangement by mother nature. However, the wind was blowing so it was difficult to get the red flowers. I put the images in the order that I took them so you would feel like you were on my walk with me! Barbed wire coiled around a fence post. Just one of the views on my walk. Scrub Oak skeleton branches. The past couple of winters have been hard on the scrub oak. Wonder what this bush is. Duke cools down in the pond--this is where the bear was about 15 minutes before we got there. A closer view of the rock...it is big! Interesting for use in collages and journals. More coiled barbed wire. This is surrounding the Hot Shots Helipad. Tree rows. This area was once used by the CCC as a tree farm so we have a lot of pines growing in rows. I love the lines. I have tons of grass photos because I love them. I can be mesmerized watching them blow in the wind. These are about 3' high. I have a lot of lichen and moss photos also. I love the different colors and textures. A poppy on the way out...literally on the way out of the trail and almost done with its life. Still beautiful though. I love the seed pods. Wild Rose in the parking lot. I started thinking about all the different areas of the world people live in. Sometimes we neglect our immediate surroundings for inspiration and think things like: If only I lived in France or could visit India, then I would have lots of inspiration. Or, If only I lived in the city/country then I would have an inspiring environment. I am sure people in France or who have visited India fill in the sentence with their own versions. It is easy to think that inspiration comes only with exotic locals. Truth is that inspiration surrounds us wherever we live. I woke up this morning thinking about being brave. I frequently find myself telling my students to Be Brave when I am guiding them down new and sometimes scary paths. This happens most often in my Stitch Journeys class where we bravely adjust our tensions and sew with the most difficult and dangerous threads and my Metal Explorations class where we courageously stitch metal to fabric and paper. I also tell myself daily to Be Brave! My newest journal cover pictured above is a reminder to be brave. Be Brave has become a motto of sorts, a mantra to repeat when I need some extra strength to conquer fear. There is a lot of fear that comes with the task of making art. Fear that it isn’t good enough, fear that everyone will know that I don’t have formal art training, fear that no one will like my work, fear that I won’t like it, fear that my work won’t convey the feelings, thoughts and ideas that I want it to, fear I will be laughed at…an endless stream of fears! It would be much easier to take on some other daunting task like climbing Pikes Peak, training a rattlesnake to do tricks or start an art retreat business in a recession! It seems a little silly sometimes to be fearful when making art. After all, there are many things in life that we need to be brave for that are much more life threatening; disease in ourselves or a loved one, war, protecting our family from harm, the loss of a job, or the death of someone special. Our country was founded by brave men and women who wanted to make big changes in our world. I am so thankful that they found the strength to be brave enough to create a new type of society that has become our wonderful country. When we make art we are sharing part of our heart and soul with the world and that can be a very scary thing…maybe even scarier than creating a new country! When we make art, we lay out our emotions for the world to see and trample upon if they like. Being Brave doesn’t have to be a solitary endeavor. I have a lot of help when it comes to being brave. My coach, mentor and friend Laura Cater Woods helps me by asking the questions that reveal the excuses I put in my path so I don’t have to be brave. My closest friends help me to be brave when they tell me what is good and bad about my work and when they cheer me on. My family helps be to be brave with their unquestioning support of everything I do. My students help me to be brave when they willingly pull on their own brave super stitcher capes and plunge forward onto the tasks I assign them. I also have my groups! I belong to 3 different fiber art groups. These groups, which I co-founded, all focus on exploring fiber art and growing as an artist. How can I possibly fail with so much support? The reality is I will fail at some things. But, one thing I have learned in this first 50 years of my life is that while failure may sting at the time, in the long run it is not really a bad thing. Failure teaches us valuable lessons and makes us stronger, kinder and more compassionate. Failure helps to make us braver. With each failure we realize that we can survive, we can grow and we can improve. Be Brave~Make Art! Cheers and Confetti for Janice!!! I will get this luscious pack of goodies in a box for you today. Send me a photo of what you create with these treasures to share with everyone! I just returned home from another fabulous weekend in Breckenridge with my quilt group. I am so fortunate to be friends with this wonderful, diverse group of women. Our art runs from traditional to experimental, our politics, religious views and music tastes are incredibly varied. Our love of great food, wine, laughter, fabric and stitch brings us together. I hope you have a group to share laughter and fabric with….if you don’t then I encourage you to start one. Entertainment over the weekend was provided by a fox family; mom, pop and 4 kits. They were out to frolic mornings and evenings while mom kept a close eye on them. It was hard to get good photos because we were pretty far away and they wouldn't cooperate with cute poses or even stay still for very long. I have lots of photos of reddish grey blurs. I used my work time to finish a quilt for my new grandson, Zakary. I hadn’t made a real quilt in a while so it was a huge surprise when it came out the right size and was perfectly squared up. I opted for a simple pattern and quilting design because this quilt is for using not saving. I used a cute jungle animal print as the centers of the blocks and built them up with strips in a modified log cabin style. The brown is some of Susan Brooks luscious hand dyed fabrics. The next few days will be unpacking from my workshop last week and re-packing and making kits for my classes in VA at Artistic Artifacts next week. The studios are a disaster! (as well as the house but we won’t go there) I could use a couple clean up fairies.